The name of Kuzma Kryuchkov was known throughout the Peoples of the Russian Empire. Kryuchkov, a Don Cossack, had his portrait on posters, cigarette packs, and even postcards, depicting his acts of bravery. The newspapers and magazines all wrote about the Cossack who was victorious in the first days of the War in battle against German cavalry near the Polish town of Kawaria. 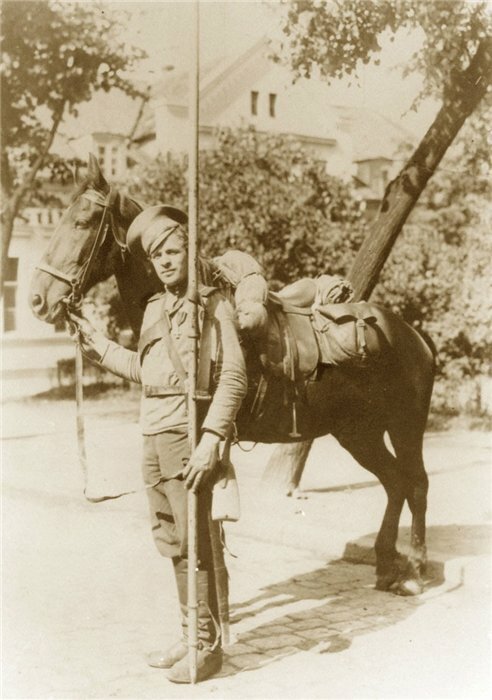 In the archives and documents from World War I, Kryuchkov was noted for being in charge of a Cossack Patrol which engaged into battle with the German cavalry. Kryuchkov had killed 11 German soldiers without a single shot fired. Here is how Kryuchkov described the events of the battle. "At about ten in the morning we headed to the town of Kalwaria Alexandrov. There were four of us- Ivan Shchegol'kov, Vasily Astakhov, and Mikhail Ivankov, and myself. We began to climb a hill and came upon a German patrol of 27 people, among them was an officer and a non-commissioned officer. At first the Germans were afraid when they saw us, but decided to climb on us. However, we met them firmly and managed to stop a few troops. Dodging the attack, we had to split up. I was surrounded by eleven people. In order to remain alive, I ran to my Horse and grabbed my rifle. I reached for a rifle cartridge but hastily dropped, as at this time the German slashed me on the fingers of the hand, and I threw the rifle. I grabbed his sword and began to retaliate. I got a few minor injuries, and I felt blood flowing down my body. My conscious had no time to recognize my wounds, so each soldier I fought received a mortal blow. Having destroyed the troops who attacked me, I felt that it was difficult to work with a sword, and took upon a spear. At this time, my fellow Cossacks coped with others. On the ground lay twenty-four corpses and a few not injured horses rushed in fright. My patrol received minor wounds, I also received sixteen wounds, - injections in the back, neck, arms. My horse also received eleven wounds, but I managed to ride back six miles to safety. In August, there arrived the commander of the army, General Rennenkampf, who awarded me with a St. George cross, and pinned it to my chest as he congratulated the first Saint George Cross award recipient of the War." The rest of his patrol was also award the Saint George Cross for their actions of bravery.